For the First Friday ArtWalk, the School of Art + Design is delighted to present works by the 20+ Art and Product Design faculty working in the 510 Oak Building. The exhibited work represents an array of disciplines from the School including digital media, ceramics, fibers, jewelry and metalsmithing, photography, painting, drawing, printmaking, sculpture, product design, and sports product design. The guided tour begins at 5:30 p.m. at 510 Oak Building and the exhibition will be on view to the public until 8:00 p.m. 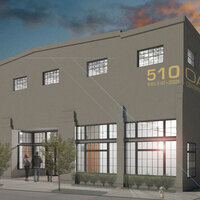 The 510 Oak building is a newly renovated 14,000-square-foot art and design research building housing the studios of 24 School of Art + Design faculty, as well as the new Center for Art Research. The creation and completion of a space dedicated to the creative practices of Art and Product Design faculty - bringing these faculty studios all into one place - represents a landmark moment at the University of Oregon and enables the School to better connect with the larger community. The Center for Art Research, located in the heart of the new building, will be a think tank for artmaking. Potential programming for the Center includes artists-in-residence, lectures, exhibitions, symposia, publications, performances, and experimental projects.